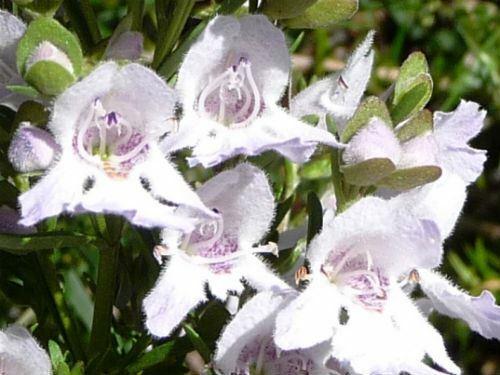 Prostanthera ‘Poorinda Ballerina’ is a hybrid mint bush. One parent may be P. lasianthos. 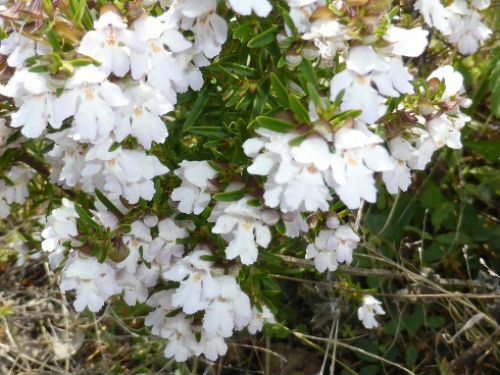 Prostanthera ‘Poorinda Ballerina’ arose at Leo Hodge’s property, Poorinda in Victoria. P. ‘Poorinda Ballerina’ is said to be a medium shrub reaching a height of two metres. In our cold climate garden plants seldom exceed one metre in height. Small leaves are one centimetre long, deep green above and paler beneath. Unlike most mint bushes this variety does not have aromatic foliage. Flowers are two centimetres long with a prominent lobe, white with orange markings and purple dots in the throat. Between October and January the foliage disappears beneath a bonanza of blooms. Plants are literally covered by flowers. P. ‘Poorinda Ballerina’ could be grown as an informal hedge bordering a path, as a feature plant perhaps in a native cottage garden or as a container plant grown on balconies and patios. P. 'Poorinda Ballerina' has proved to be drought and frost tolerant.